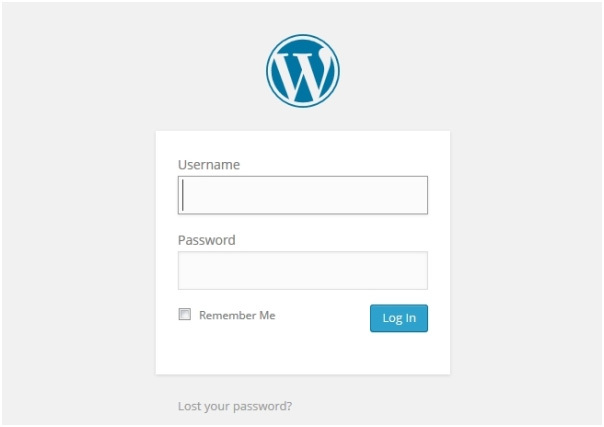 If you are yet to install WordPress, head back to Step 2 to read up the easy WordPress installation tutorial. Now that you have learnt the basics of blogging, let us proceed to more information about blogging. 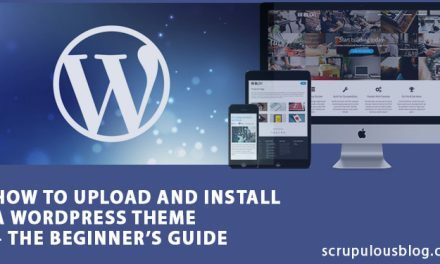 WordPress is a powerful and incredible tool that helps in building blogs with all the creativity and flexibility you require. Maybe you might not like the design of your blog; do not worry about it. I will be shown how to change the design and layout of your blog and a host of other useful tips for modifying your blog. You need to create a menu to help your blog readers navigate through your blog to find what they are looking for by clicking on the links there. 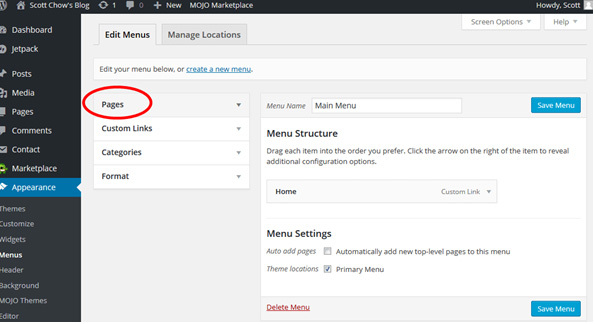 In the blog administrator area of your blog, look at the menu on your left, click on “Menus”. 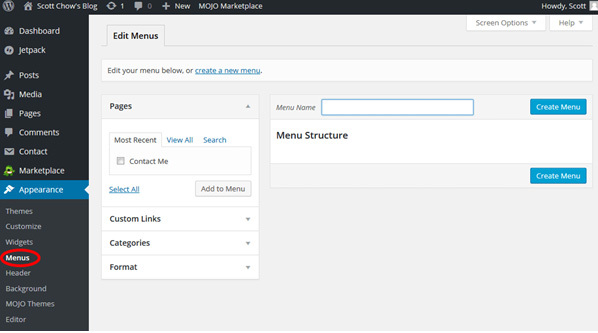 Here, we will create a menu called “Main Menu”. 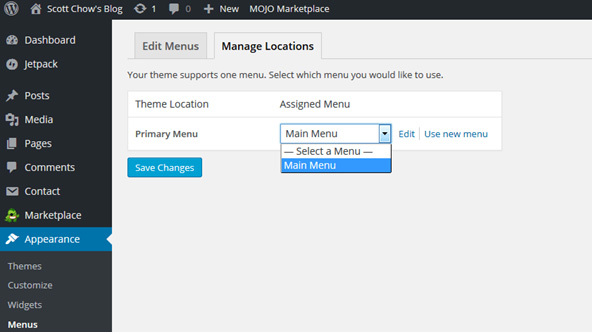 In the box for “Menu Name” type it in the box and click on “Create Menu”. We will begin to add items to the menu. First, you will create a link to the home page of your blog. Click on “Custom Links”, then type the url of your blog; that would be “http://” and your domain name will follow. For our example, I will use http://www.scrupulousblog.com. Next, type in the “Link Text”: this is the text that will appear in the menu and will link to your home page. I will call this link “Home”. After you enter the url and link text, click on “Add to Menu”. Add another item to the menu. You can add a link for the page you created previously. To do this, click on the “Pages” section of the menu editor. This will show all the pages which you created. Here you may either see a “Sample Page” or it may be blank if you have not created any pages. To create a page, click on “Pages” on the left area of the administrator area, then, click on “Add New”. Here, I will add a page called “Contact Me” on the menu, so I will click on the box beside the page and then click “Add to Menu”. Next, I will click on “Save Menu” to save the changes. Next, I will add the menu to the blog by clicking on the “Manage Locations” tab. For this illustration, I will add the menu I just created to the primary menu using the drop-down box and save it by clicking on “Save Changes”. Different bloggers have different opinions when it comes to deciding what their blog appearance should be. Something good about WordPress is that you can change the whole layout and design of your blog with a few clicks. The following as some samples of free WordPress designs. 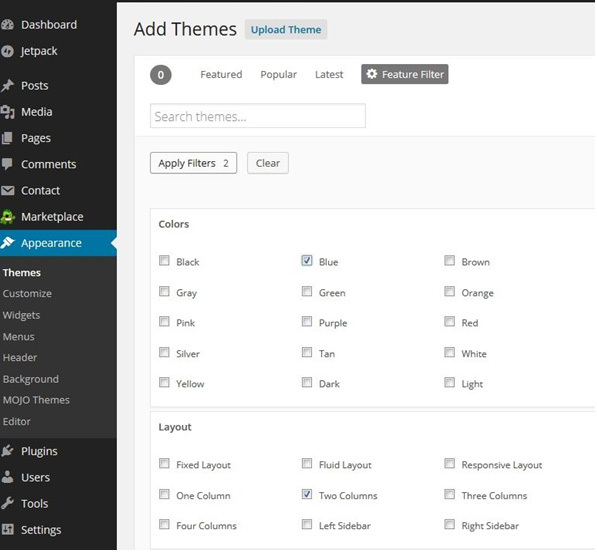 In WordPress, Site layouts are known as “Themes”; they determine the layout of your blog. Click on the “Appearance” tab on the left menu to change the theme. In there you will see many themes already installed. These are beautiful and yet simple themes which you can use on any blog. Many top bloggers make use of some of these themes. I would suggest you use one of these themes to test the waters unless you have a particular design which you would prefer. We will be making use of the theme named “Twenty Twelve”. Place your cursor on the theme and click the “Activate link” to activate it. With just one click you have completely changes the whole design and layout of your blog! If you do not like any of the already installed themes, no need to worry. 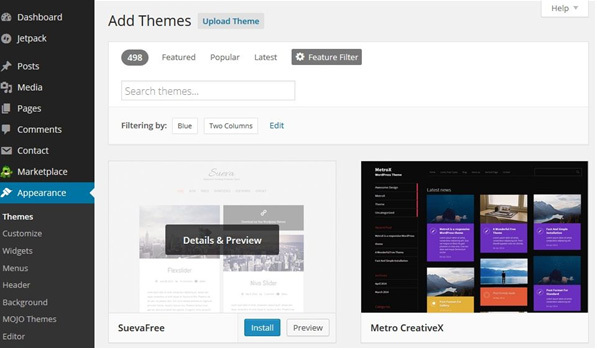 There are lots of other free themes at your disposal. Click on the “Appearance” tab on the left menu. In the screen that follows, click on “Add New”. You will be taken to the search screen of the theme. There are lots of ways to find a theme you will like. You can either search by color, layout etc when you click on the “Feature Filter”. Click on the box against the option you choose and click on “Apply Filters”. Now you can browse for the theme you prefer. Hover over the one you like and click on the “Install” button. After the theme has finished installing, click to activate it; next visit your site to see the changes made by the theme. Plug-ins are additional tools made by developers to add extra features to your site. There are tons of free plug-ins which you can use to achieve many things on your blog. There are plug-ins used to add social media buttons, enhance blogs for search engine optimization and creating contact forms. There is a free plug-in known as JetPack every new blogger should have. This plug-in adds extra easy-to-use features to your blog. Examples include, ability to add images to sidebar menus, site traffic, publish post to Facebook and more. Like many plug-ins Jetpack is optional and you can do your blog without it. I have found out that many bloggers love the extra features in the plug-in. You now have a basic blog design and navigation. You can customize your blog even more to suit the way you want it. 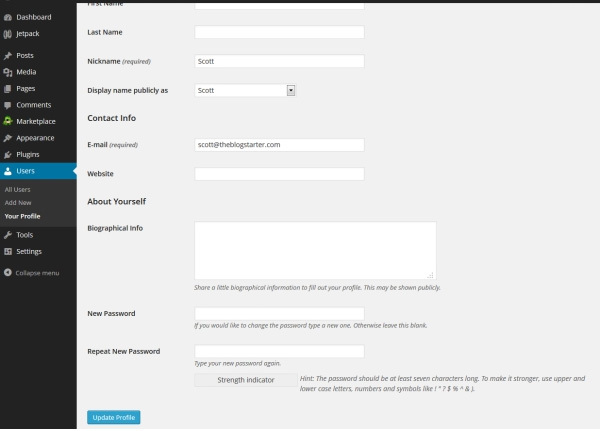 This you can do by clicking on “Appearance” in the administration area, then click on “Customize”. You will be taken to a screen showing your customization menu and home page on the left and right respectively. If you are using a different theme, the customization option may differ a bit. A lot of customization can be done on this screen. Let us look at them one by one. Here you can change the background color and text color of the header. These can be changed here. They appear at the top part of the blog and can be remove completely if you uncheck the box for “display header text”. With this option, you can upload an image to use as background if you choose to. You can add an image to the header section here. Each theme has a recommended size for the header image. Widgets are items which can be added to the side bar of your blog. With this option you can either add or remove widgets from the side bar. Here is an example to further clarify this. Firstly, on the main side bar click on “Widgets” and “Main Sidebar” to reveal the widgets that are currently in use in the main sidebar area. 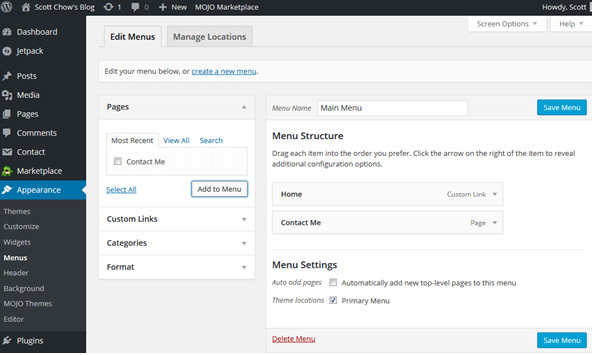 You can choose the Navigation menu you want for your blog. You must have created a menu by now as I explained that earlier. There are 3 widgets here: Meta, Search, and Archives. When you look at the sidebar on the right of your blog, you will see how these widgets display. The archives widget displays a monthly archive of your post, a search field is created by the search widget, and the Meta Widget displays a variety of links related to your blog. I do not want to use these widgets so I will get rid of them. This I will do by clicking on the arrow beside the widget name and click on “Remove” to delete them. I will add some widgets which I want by clicking on the button that says “Add a Widget”, then I’ll select the widgets. I will add the widget for Recent Posts to create links to my recent posts which will be shown in the sidebar. I will also add a widget for Calendar to show the dates when I made posts. After that, I’ll click on the “Save & Publish” button. You are free to check out the other available widgets to see how they function. Any time you create a new post, you will be creating a new page with a new URL at the same time. The new URL will be set using permalinks. Scroll over the tab for “Settings” on the left menu, to modify the setting. Choose one of the options in the Permalinks category. 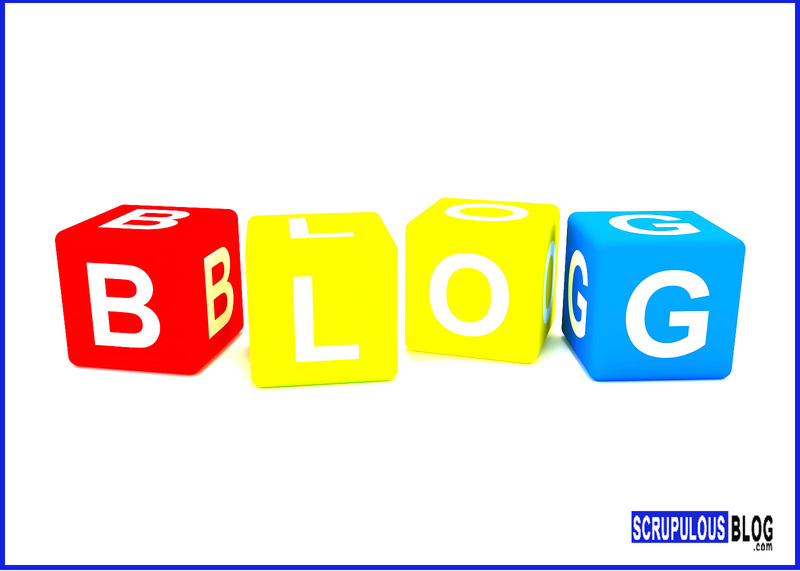 On scrupulousblog.com, I will be using the settings “Post name”, however any option will be fine and will not affect the usability of your site in any way. It is important to change the user details of your blog when starting a blog so as to let the readers have some background information about you. To do this, click on the “Users” tab on the left menu. Click on “Edit” under your username. You may want to also change your Nickname and email on the user details page. Note that your nickname will show up on all the post which you will make. Type in what you want as your nickname and select the same name in the list for “Display name publicly as”. Once you complete all the necessary changes make sure you click on “Update Profile” at the bottom of the screen to save changes. After you have completed this step, your blog will be functioning and attractive to your readers. You can always make extra changes later on. Everything must not be done perfectly the first time. Next, we shall be looking at “Creating Your Post”!